Due to the difficulty in describing the political situation of Egypt without being boring, I’ve decided to write this article based on screenplay by Ron Howard TV movie “Tut and Tuttle”, aired in 1982 (here in Brazil). Meditating over the small cupper pyramid and holding his quartz crystal small version (my father gifted me both pyramids in the seventies), I went to Ancient Egypt accompanied by a protector lion. 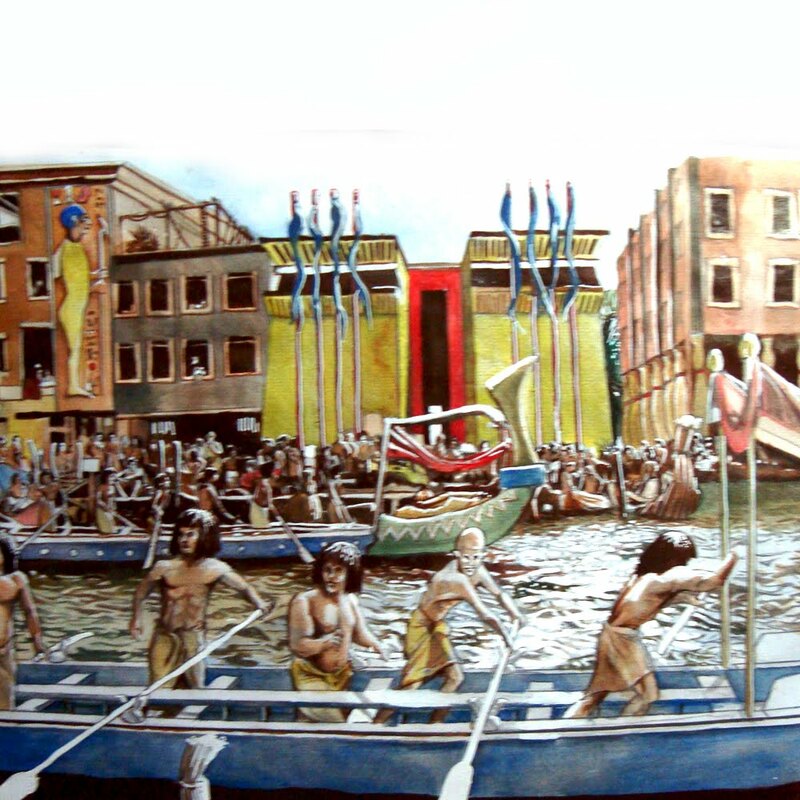 Our hosts were Prince Rahotep and his wife Nofret. 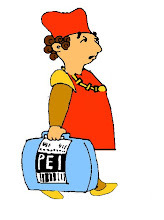 He was a Prince in Ancient Egypt during the 4th dynasty. It is not clear if his is son of pharaoh Sneferu and his first wife. Zahi Hawass suggests his father was Huni. Anyway, Rahotep's titles were inscribed on a magnificent statue of him side by side his wife, Nofret, found inside his mastaba at Meidum in 1871 describing him as High Priest of Ra at Heliopolis (with the added title, unique to Heliopolis, Ra's town, of "Greatest of Seers"), Director of Expeditions and Supervisor of Works. He also has a title given to high nobility, "the son of the king, begotten of his body". 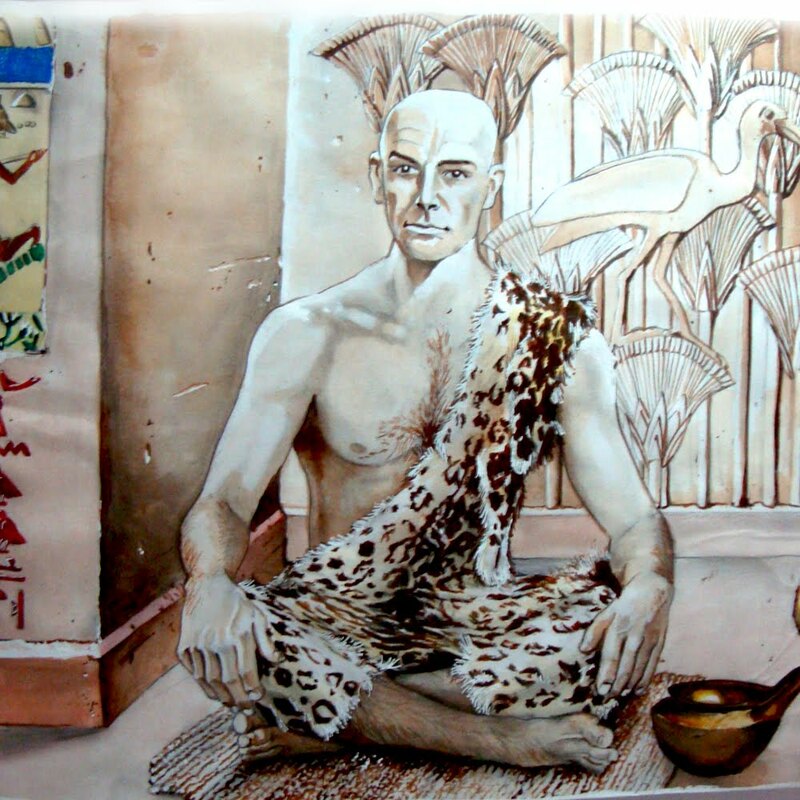 Rahotep's older brother was Nefermaat, and his younger brother was Ranefer. Rahotep died when he was young. 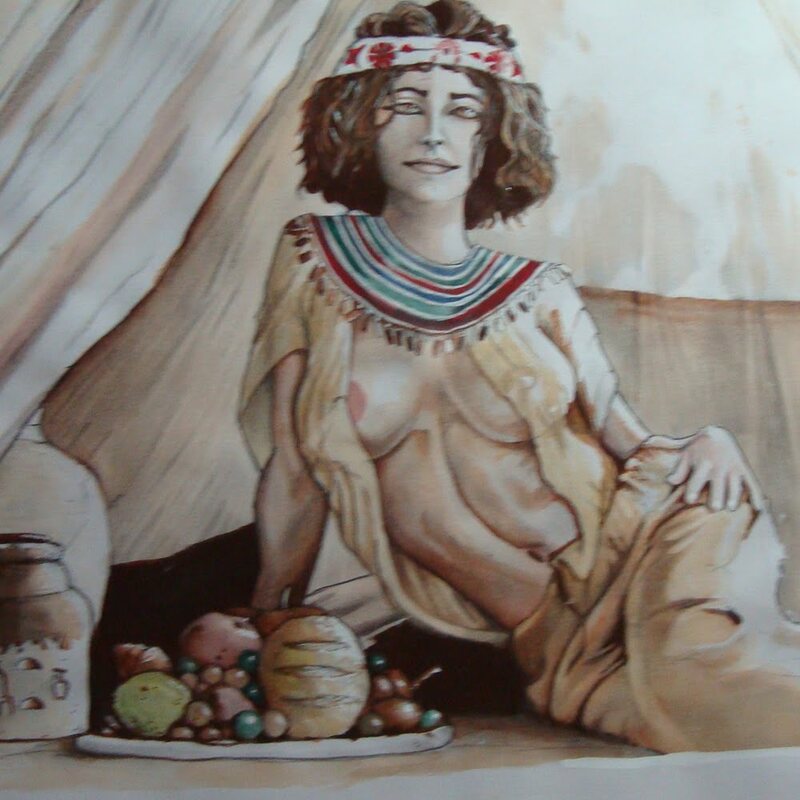 Rahotep's wife, Nofret is very beautiful, her parents are not known and the circumstances that made her marry Rahotep are uncertain. Nofret and Rahotep had three sons – Djedi, Itu and Neferkau – and three daughters – Mereret, Nedjemib and Sethtet. 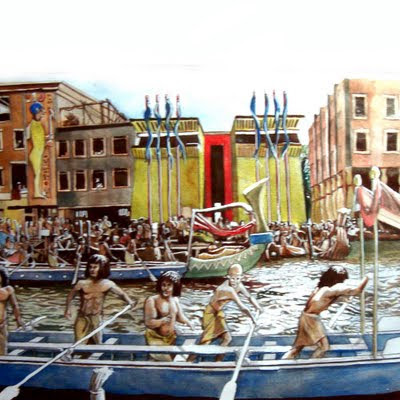 Rahotep said that he should travel to the Sinai turquoise mines, and if we want, we could go with him to encounter his half-brother Khufu that will become pharaoh after Snefru's death. 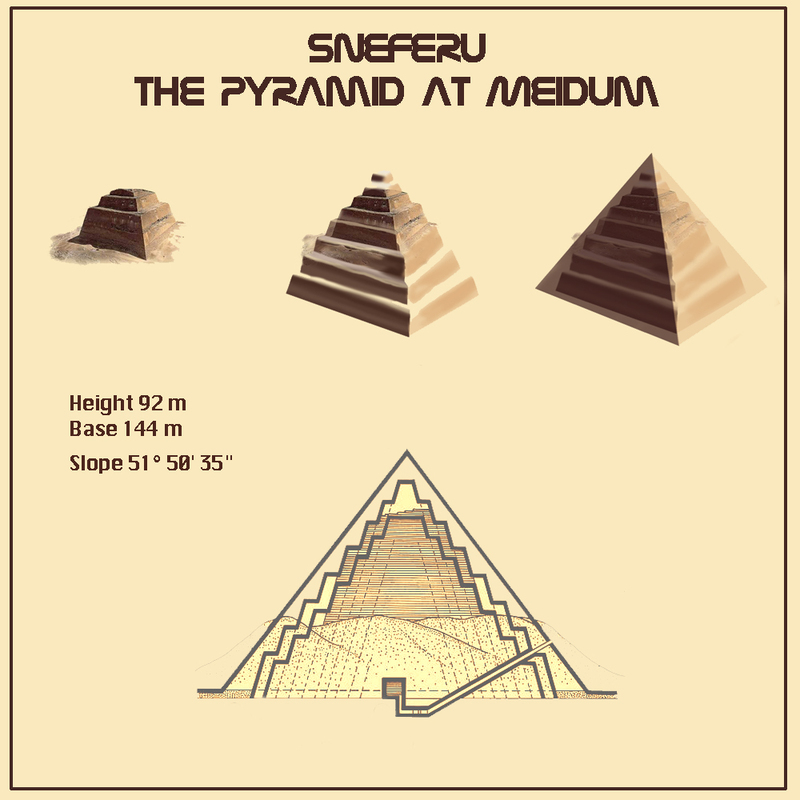 Snefru must ensure extensive work and storage of materials to enable them to undertake massive construction projects (such as the pyramids). Sneferu's military efforts in Libya led to the capture of 11,000 prisoners and 13,100 head of cattle. Aside from the extensive import of cedar (most likely from Lebanon) described above, there is evidence of activity in the turquoise mines on the Sinai Peninsula and also a large-scale quarrying projects to provide Sneferu with the stone he needed for his pyramids. 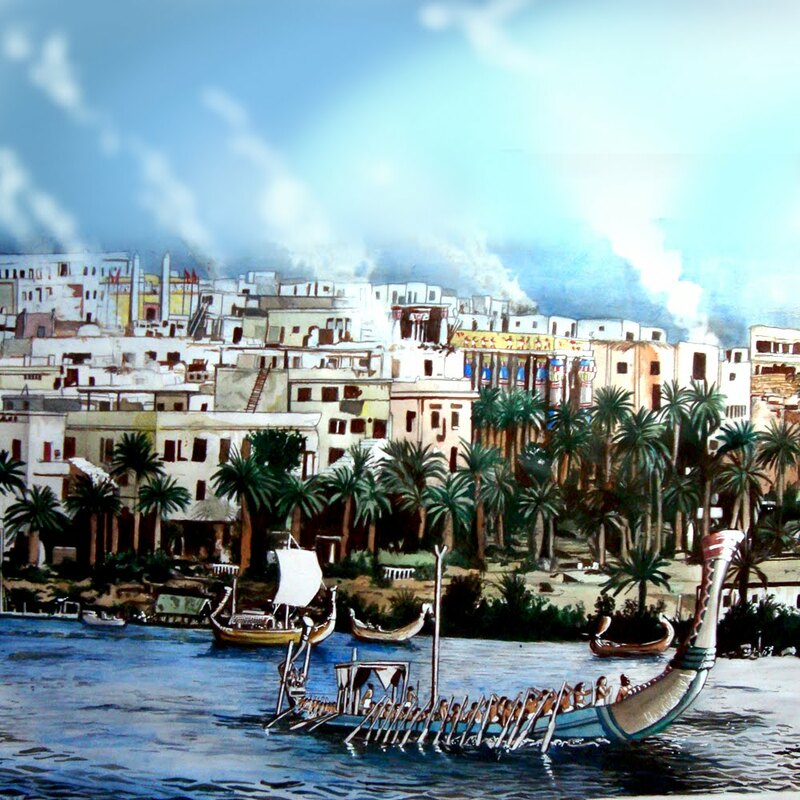 The travel was tense; the popularity of Sneferu after his fast and effective campaigns left much to be desired. 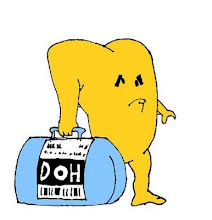 People seem to be looking down at us with a suspicious expression. We reach turquoise mines by night and the 23 year-old Khufu was having trouble with a group of Mentiu (or Moniti, a name which is applied to a tribe of Bedouins that wear strange hats of the Sinaitic Peninsula). The lieder of the group, took advantage of the relatively open road to hit Khufu. Rahotep react immediately, saving his half brother’s life. 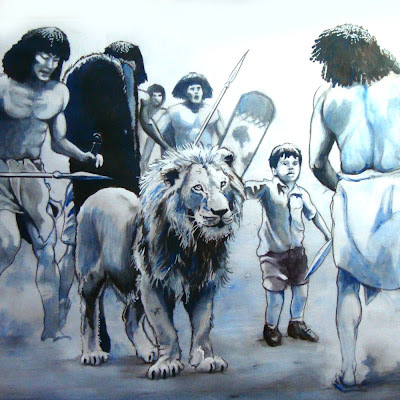 On the rocks of what is known today as Wady Magharah, we could see stone tablets representing the monarch in the act of smiting an enemy, whom he holds by the hair of his head, with a mace. 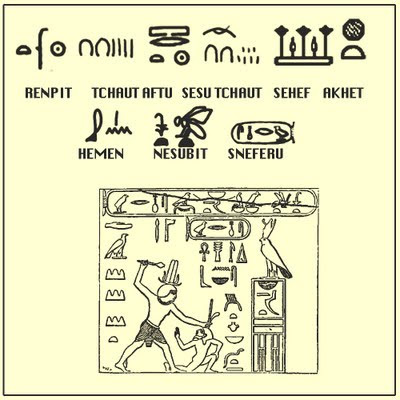 The action is apparently emblematic, for at the side we see the words Ta satu, "Smiter of the nations;"
Sneferu used to call himself Neter aa, "the Great God," and Neb mat, "the Lord of Justice." He is also "the Golden Horus," or "the Conqueror." Neb mat is not a usual title with Egyptian monarchs; and its assumption by Sneferu would seem to mark, at any rate, his appreciation of the excellence of justice, and his desire to have the reputation of a just ruler. 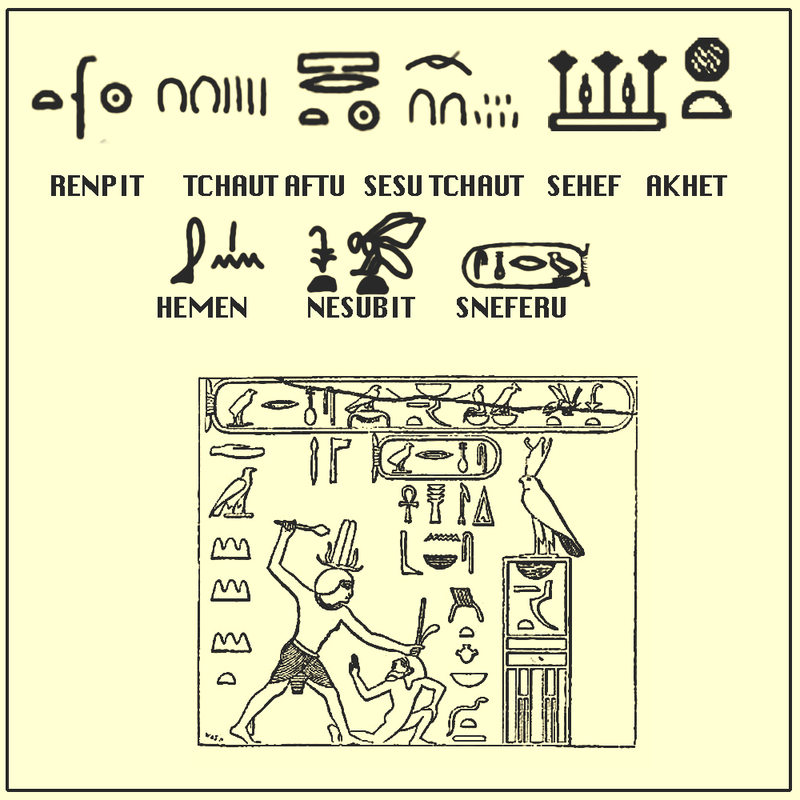 Sneferu had reduced to subjection these tribes, which in his time inhabited the Sinaitic regions. The motive of the attack was not mere lust of conquest, but rather the desire of gain. After the revenge of the Mentiu tribe by attacking Khufu, we went to Ankhaf’s quarters. 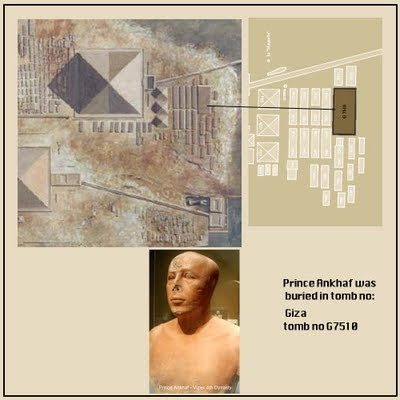 Back to Menphis, we went to the temple of Ptah to receive the blessings of the High Priest, and then to the temple of Toth, where Ankhaf would take care of Khufu’s injuries. Nofret was there, and left the place with a strange look in her eyes. 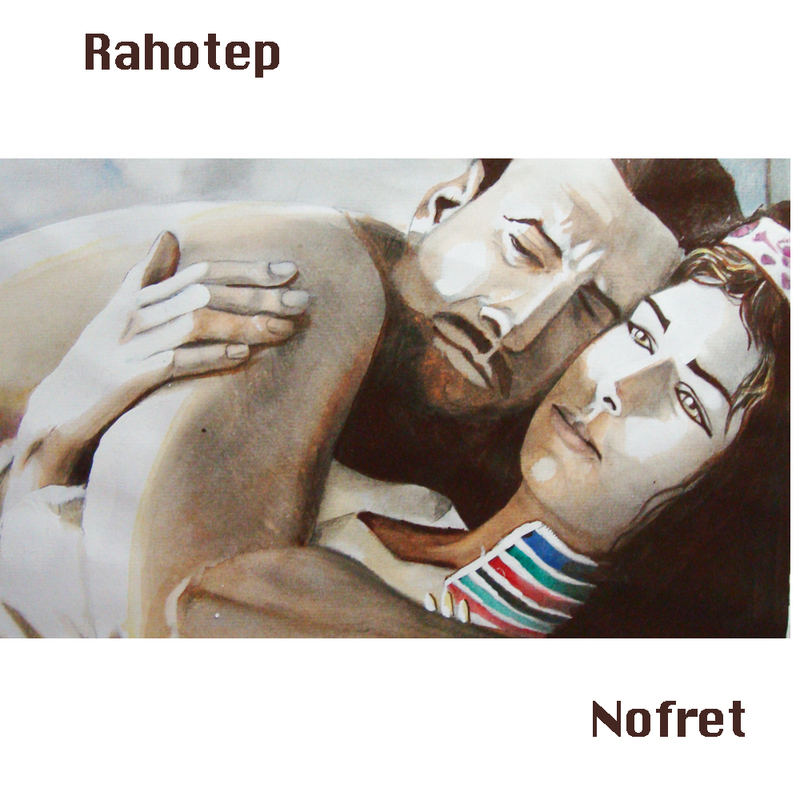 I don't mean this as gossip – but I believe that Nofret is having an affair with Ankhaf. 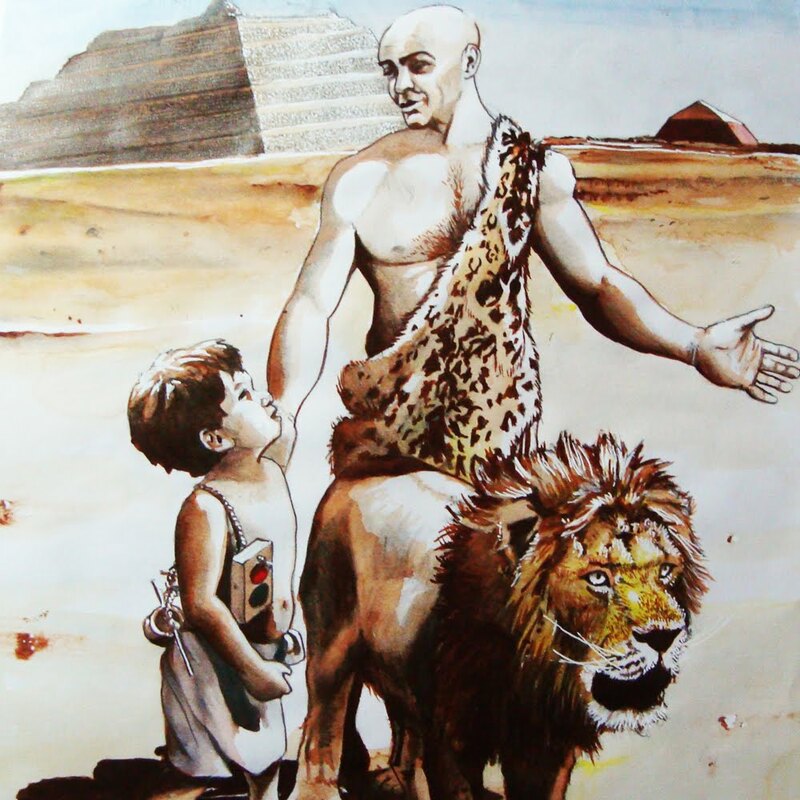 Ankhhaf was a son of pharaoh Sneferu and an unknown wife. He had an elder brother, Kanefer. 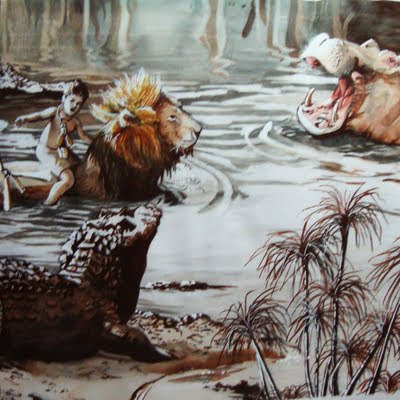 He was younger half-brother to Khufu, who became a king after Sneferu died. Ankhhaf had the titles "eldest king's son of his body" (sa nswt n khtf smsw), "vizier" and "the great one of Five of the house of Thoth" (wr djw pr-Djehuti). Ankhhaf's tomb in Giza (G 7510) depicts his sister-wife Princess Hetepheres. Hetepheres was the eldest daughter of Sneferu and Queen Hetepheres I and thus Ankhhaf's half-sister. 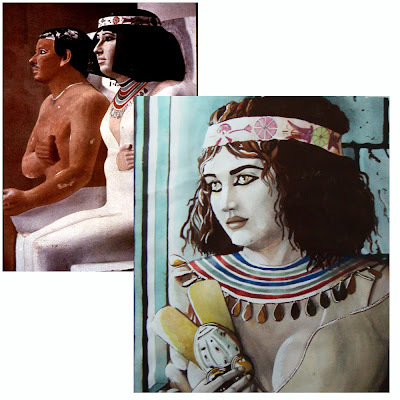 Hetepheres had the titles "eldest king's daughter of his body", "the one whom he loves" (sat nswt n khtf smst mrt.f) and "Priestess of Sneferu" (hmt-nTr Snfrw). Ankhhaf and Hetepheres had a daughter, who was a mother of Ankhetef. Ankhhaf and Hemiano was the main responsible to the building of the Great Pyramid of Giza and played a role in the construction/reformation of the Sphinx. (Ankhaf’s mastaba tomb, G 7510, was the largest in the eastern cemetery at Giza). After attending his half-brother Ankhaf came to talk to us. 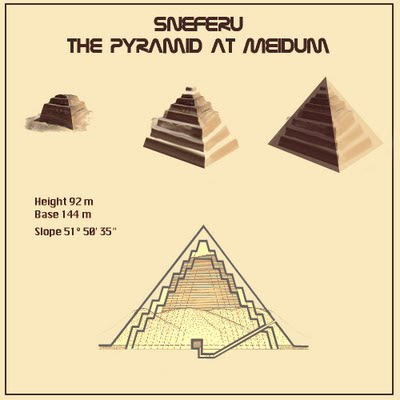 He promised that we would visit, next morning, the brand new pyramids of Snefru. 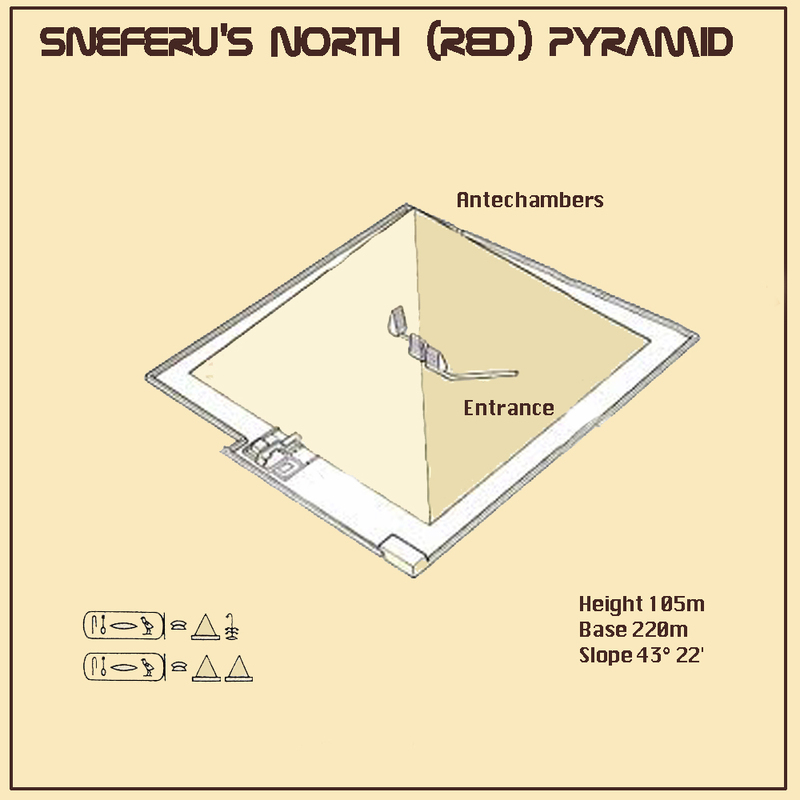 The most well known monuments from Sneferu’s reign are the three pyramids, two built in Dahshur (the Bent Pyramid and the Red Pyramid) and one in Meidum (Meidum pyramid). 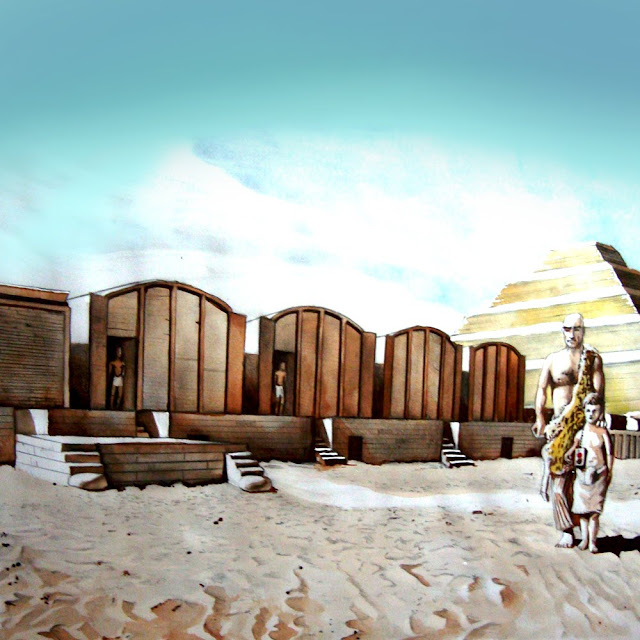 Under the reign of Sneferu, was developed the major evolution in pyramidal structures, which would lead to construction of the Great Pyramid of Khufu. The first of three pyramids is an immense stone structure. 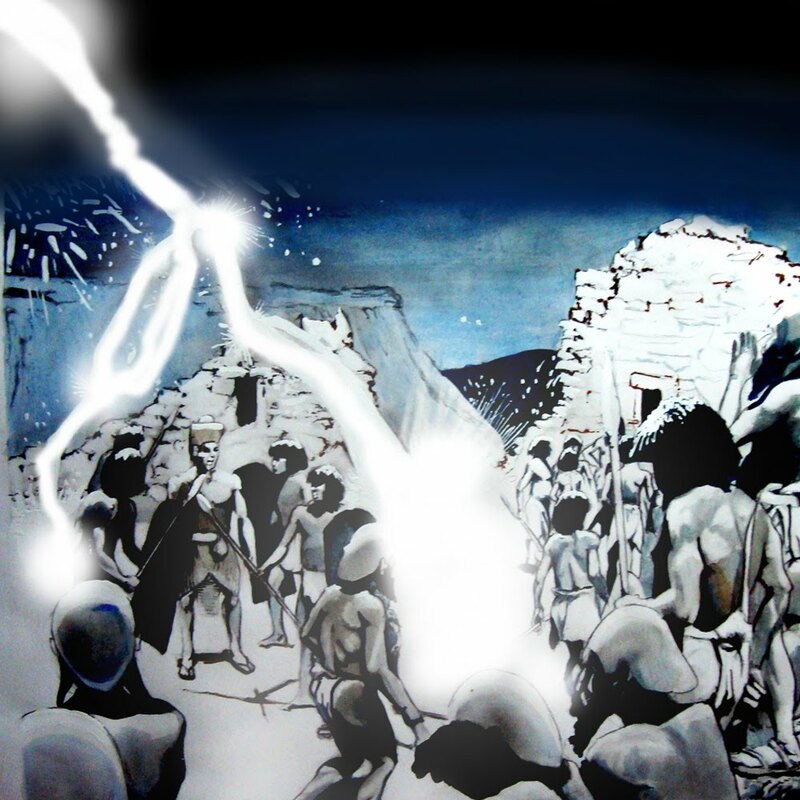 It serves as physical testimony to the transition from the stepped pyramid structure to that of a “true” pyramid structure. (Archaeological investigations of the pyramid shows that it was first conceived as a seven-stepped structure, built in a similar manner to the Djoser complex at Saqqara. Modifications later were made to add another platform, and at an even later stage limestone facing was added to create the smooth, angled finish characteristic of a “true” pyramid). Also known as the Rhomboidal or Blunted Pyramid, attests to an even greater increase in architectural innovations. 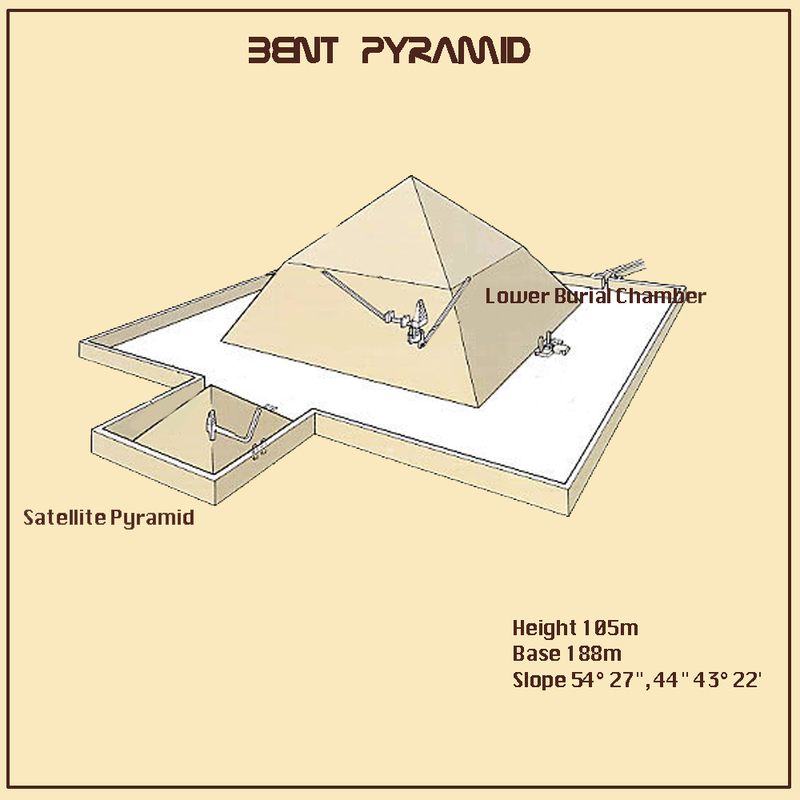 As the name suggests, the angle of the inclination changes from 55° to about 43° in the upper levels of the pyramid. It is likely that the pyramid initially was not designed to be built this way, but was modified during construction due to unstable accretion layers. The satellite pyramid complementing Sneferu’s Bent Pyramid introduces more change in the architecture of the time, when the passage way is built ascending westward (as opposed to the conventionally descending northward direction of the passages of previously build pyramids) towards the burial chambers. With the increase of innovation in Sneferu's building projects, one expects that his last pyramid, the Red Pyramid, will show the greatest complexity and change in architecture yet. Upon first glance, one may be disappointed seeing that the construction of the Red Pyramid seemingly is simpler than its predecessor. Due to the advances achieved by Sneferu team, secret chambers could be waiting to be uncovered within the stone superstructure. (Considering that the remains of King Sneferu have not yet been found, it still may be possible that his sarcophagus and mummy lie hidden in his mysterious last structure). 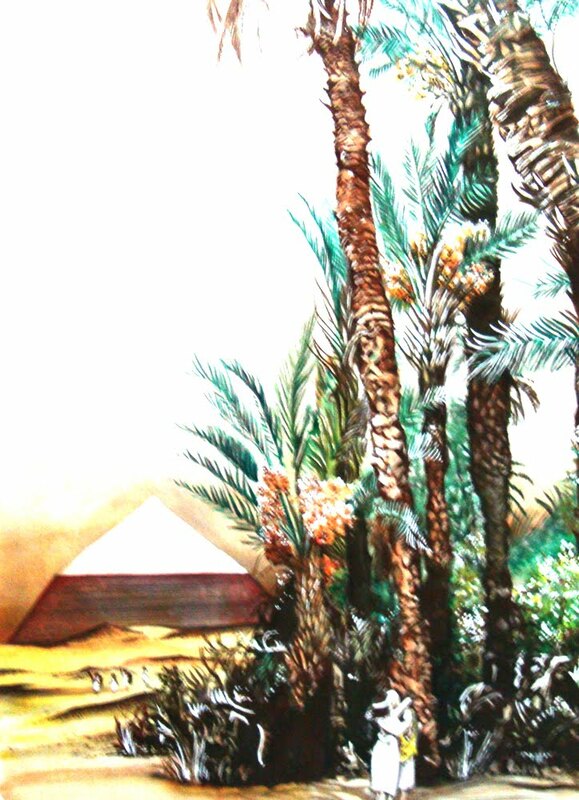 Ankhafer makes fun of the first two pyramids by saying “the Bent Pyramid and the Steps Pyramid of Meidum are the largest open air drafts ever built”. Some weeks later, Sneferu succumbed to a disease and Khufu came to the Egyptian throne in his twenties. 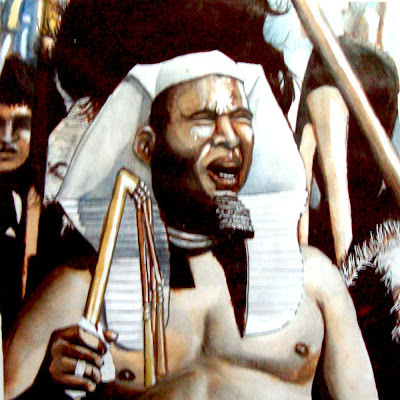 Khufu was the son of King Sneferu and Queen Hetepheres I and brother of Princess Hetepheres. Unlike his father, Khufu was a cruel and ruthless. 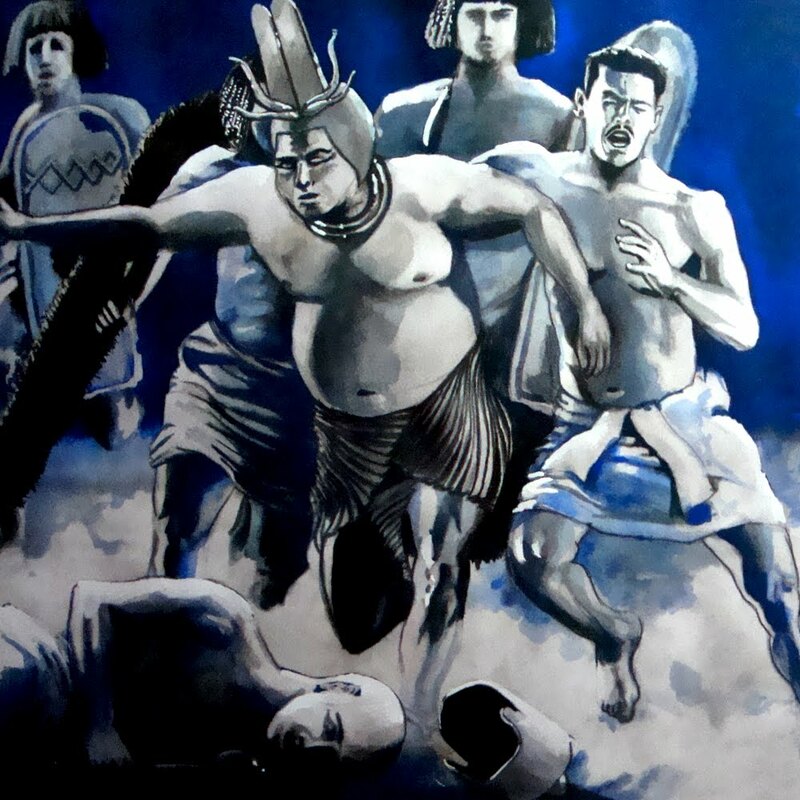 Khufu had nine sons, one of whom, Djedefra, was his immediate successor. He also had fifteen daughters, one of whom would later become Queen Hetepheres II. 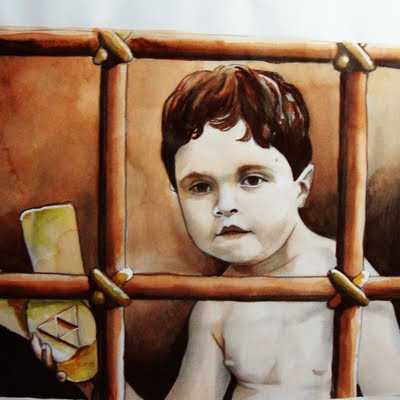 (Several of Khufu's sons are known from the papyrus Westcar, while other children are merely known from their tombs in Giza. Cemetery G 7000 contains several of the mastabas of these royal children. Khufu's negative reputation lasted at least until the time of Herodotus, who was told further stories of that king's cruelty to his people and to his own family in order to ensure the construction of his pyramid). Khufu knew that he must take the chance to build the best pyramid ever; he had the most experienced team of constructors, financial resources, and determination. He started the work even before the end of his first year. One of the biggest falsehoods about the Great Pyramid of Khufu is that it was built by slaves. Zahi Hawass discoveries in the tombs of the Pyramid builders on the Giza Plateau, have finally and conclusively put this theory to rest. We now know with certainty that the Pyramids were built by Egyptian men and women -- not slaves! 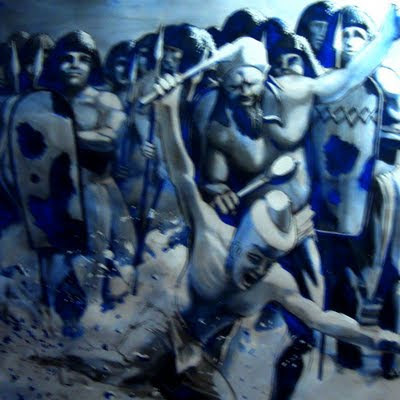 Slavery, while it existed in Ancient Egypt, was not an important part of the economy, especially in the Old Kingdom, and, moreover, it is important to examine the meaning of the word "slavery". We think of slavery as the ownership of a person. In Ancient Egypt the word "slavery" meant a person who worked for another, like the modern term "servant". 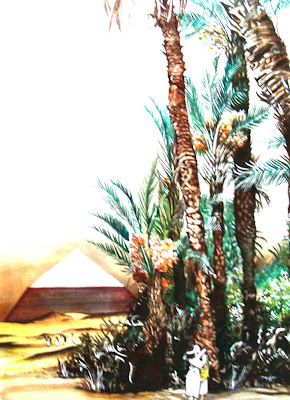 The construction of Pyramids was a national project. The massive monument symbolised the might and power of the royal house. In Ancient Egypt, it was essential for the Pharaoh to build a tomb to ensure his rebirth as a god in the afterlife and thus magically maintain the right order of the universe. 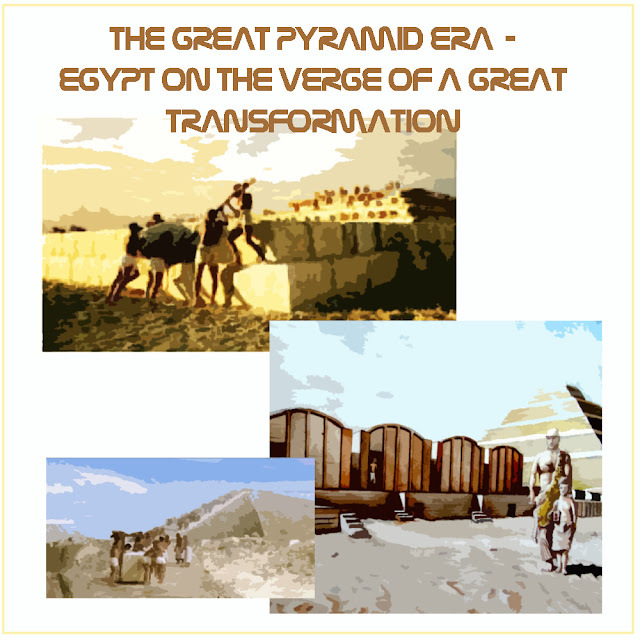 Every household from Upper to Lower Egypt participated in the construction of the Pharaoh's tomb (pyramid). Every family helped by sending food, materials and manpower. From hieroglyphic inscriptions and graffiti we infer that skilled builders and craftsmen probably worked year-round at the Pyramid construction site. Peasant farmers from the surrounding villages and provinces rotated in and out of the labour force. Time to get back to the future, now we know the forces behind the construction of this intriguing monument. 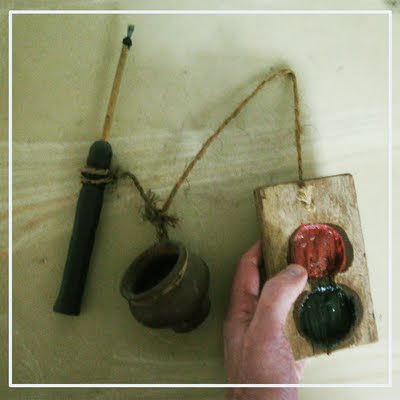 “Ops” seems like I brought a little souvenir from ancient Egypt. Why different civilizations built pyramids?